He was born in Baku in 1973. He graduated from the A. Azimzadeh State School of Arts in 1992. 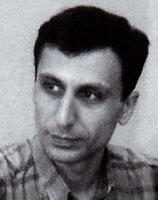 Then he graduated from the Azerbaijan State University of Arts and Culture in 1998. He takes part in an exhibitions held in Azerbaijan. He has been teaching in the Azerbaijan State Academy of Arts since 2001. He is a member of the Azerbaijan Cartoonists’ Union from 2007.